Isolated HVAC, climate controlled, assembly area. Large capacity downdraft tables for trimming and bodywork of parts and assemblies. Semi downdraft paint booth and HVLP spray equipment for applying primer and top coats. Continuously monitored ESD stations for assembly of sensitive electronic components. Assembly of composite and metallic components using a variety of adhesives and mechanical fasteners. Custom precision fixturing enabled by the capabilities of our in house engineering department and CNC machine centers. CNC trimming of components and assemblies using mechanical or vacuum fixturing. Detailed inspection of components and assemblies using CMM and 3DGage measuring arm as well as the ability to make custom inspection fixtures and gauges. 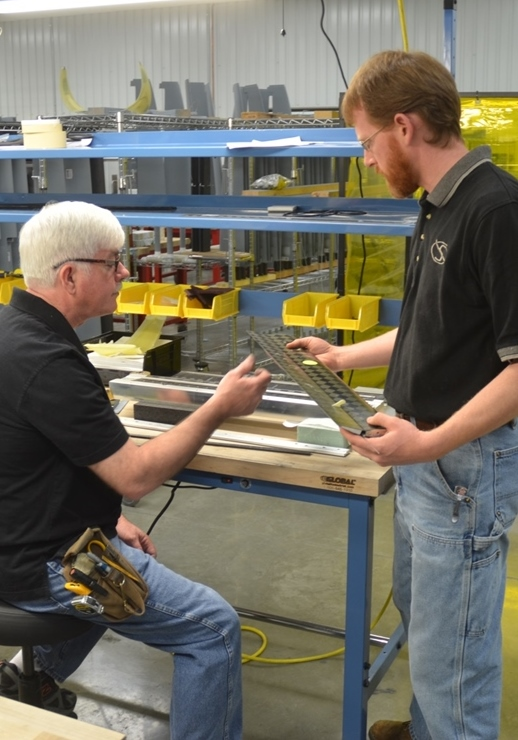 Electronic component assemblies done at ESD stations with IPC certified specialists. Shelf life management program for all adhesives and coatings. Lot/serial number control of raw materials and components throughout the process.